Psoriasis is incurable in medical description, but Homoeopathy can root out the inner disease state with suitable dynamic drug to annihilate the illness completely with great confidence as per theoretical explanations guided by the Homoeopathic principles. This clinical case is presented from AKP Homoeopathic Clinical Research Center. This case study gains confidence in treatment. · Scaling and peeling of skin in both palms and soles since six years. · The lesions were thick, scaly, parched, cracked, fissured and with bleeding spots in some places. 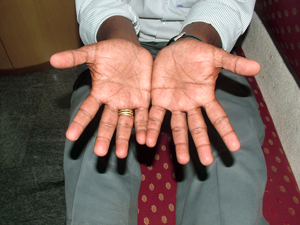 Initially the lesions appeared in both the palms symmetrically and the plantar surface of both the feet involved. Complaints are worse in winter. Had cold and cough at frequent intervals with fever , had vaccinations for all communicable disease. Father had psoriasis, paternal grand father suffered with bronchial asthma. 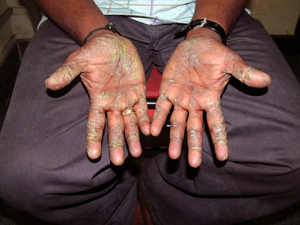 Had allopathic treatment initially and tried all topical applications in vain. Finally had siddha medicines for one year. Petroleum was prescribed based on the totality of symptoms, more importance to the particulars and nature of lesions and time modality with an interpretation and evaluation of miasm psora -syphilitic expression. Recurrence after three years shows the diseases state is being annihilated from the vital force and need for a high potency to root out totality.